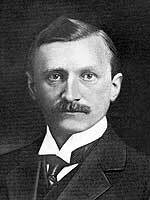 Born at Schleswig-Holstein, Germany on 28 June 1875, son of Rev. George and Sophie Hansen, he attended the public and high schools of Schleswig, later moving to England where, from 1898 to 1907, he worked in various financial enterprises. On coming to Canada in the latter year, he came to Winnipeg and, in 1911, incorporated the North Saskatchewan Land Company. He was actively involved in the development of farm land in central and northern Saskatchewan and Alberta. He also organized the Terminal Cities of Canada Limited to acquire land along the lines of the Canadian Northern Railroad. He acquired 40,000 acres of land in the Goose Lake area of Saskatchewan via his compoany, the Kindersley Farm Lands Limited. In 1901, he married Nancie M. Johnson. They had a son and a daughter, and resided at 869 Grosvenor Avenue, Winnipeg.